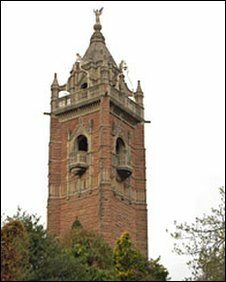 Bristol's Cabot Tower has been granted £200,000 towards repairs aimed at restoring and re-opening it. The Grade II-listed Brandon Hill monument, owned by Bristol City Council, was closed to the public for safety reasons in 2007. English Heritage announced the "substantial" grant earlier. The viewing tower was built between 1896 and 1898 to mark the 400th anniversary of explorer John Cabot's voyage from Bristol to America in 1497. The entire restoration project is expected to cost from £400,000 to £420,000. An English Heritage spokesman said investigations had revealed that cracks in the tower's masonry were caused by corrosion in steelwork in the viewing platforms' concrete floor slabs. He added that the grant was based on the likely repair costs, the council's contribution, and the likely contribution from fundraising. Cllr Simon Cook, Cabinet member for culture, sport and capital projects, said the grant, along with the £150,000 the council has committed, would go a long way towards the expected final costs. He said: "Work has been ongoing since the start of the month and will continue now in stages through the year and into 2011 on this complex restoration project. "But the end result will mean that this much-loved landmark will be re-opened then for all to enjoy once again." The climb up the stone steps to the top of the tower gives visitors panoramic views of the city and harbour.